We will be celebrating the Christmas with Holy Mass on Saturday, December 30, 1989, at 6:30 p.m., at St. Mary Magdalene Church, Melvindale, Mich. Families of the North Zone are requested to provide the X-Mas dinner during the social gathering. Please call Mr. Joseph Thakkolkaran at 977-8573 or Mr. Sebastian Devasia at 791-7691 with you choice of items. 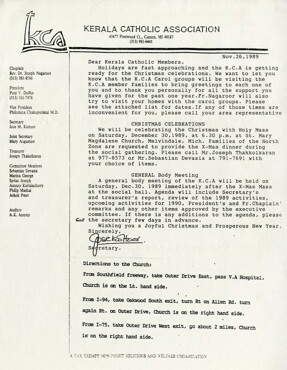 A general body meeting of the K.C.A. 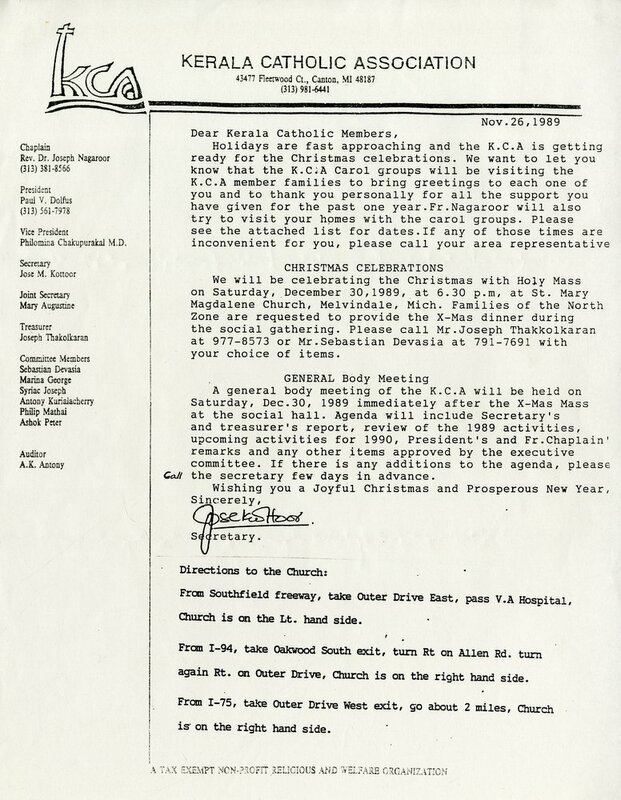 will be held on Saturday, Dec. 30, 1989 immediately after the X-Mas Mass at the social hall. Agenda will include Secretary’s and treasurer’s report, review of the 1989 activities, upcoming activities for 1990, President’s and Fr. Chaplain’ remarks and any other items approved by the executive committee. If there is any additions to the agenda, please call the secretary few days in advance. From Southfield freeway, take Outer Drive East, pass V.A. Hospital, Church is on the Lt. hand side. From I-94, take Oakwood South exit, turn Rt on Allen Rd. turn again Rt. on Outer Drive, Church is on the right hand side. From I-75, take Outer Drive West exit, go about 2 miles, Church is on the right hand side.